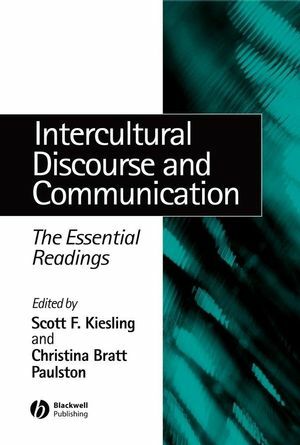 Intercultural Discourse and Communication: The Essential Readings is a collection of articles that discuss major theoretical approaches, case studies of cultural and sub-cultural contact from around the globe, issues of identity in 'bicultural' individuals, and the 'real world' implications of intercultural contact and conflict. Collects articles that describe and analyze discourse and communication in several channels, including spoken, written, and signed. Considers various group organizations such as culture/subculture, gender, race/ethnicity, social class, age, and region. Includes brief introductions to each section by the editors that explain main concepts. Contains discussion questions that enhance the book’s value for courses. Scott F. Kiesling is Assistant Professor of Linguistics at the University of Pittsburgh. His work on areas such as language and gender, language and ethnicity/race, discourse analysis, sociolinguistic variation, and Australian English has been published in Journal of Linguistic Anthropology, Journal of Sociolinguistics, and various edited volumes. Christina Bratt Paulston is Professor Emerita of Linguistics at the University of Pittsburgh. She served as chair of the department from 1974 to 1989 and as director of the English Language Institute from 1969 to 1998. Her numerous publications include Sociolinguistics: The Essential Readings (Blackwell 2003, edited with G. Richard Tucker), Memories and Reflections: The Early Days of Sociolinguistics (1997, edited with G. Richard Tucker), and Sociolinguistic Perspectives on Bilingual Education (1992).